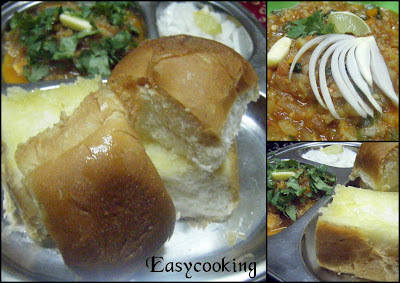 Easycooking: Pav Bhaji ~ Street food at its best!! My first introduction to chaat was in a small make-shift cart which sold chaats,called "Yadav Chaat-wala".But even then,the last thing my dad would let us do was to stand on the road-side and devour chaats..;).So my bro used to pack it and bring it home hiding it from appa.Of course,he found out eventually,but then he disliked we having food from roadside anyway.After a while,Bombay Chaats[as it was/is populary known as]was available in restaurants and we went berserk ordering it everytime we went to "Canopy" a popular restaurant in Ernakulam below Abad Plaza. Once,while having a plate full of Pani puri in Bangalore,I happened to see something-I wouldn't go into the detail of what I saw,but that made me off-chaats for a long long time.I know cleanliness and hygiene is least expected when it comes to chaats..but still.After that incident,chaat to me was Pav bhaji,I was put off all chaat items except Pav bhaji[Thank God for small mercies;)]. I have got over the off-chaat phase now and will jump at the opportunity to have it,but I am more careful now and have it only from places where I know a basic level of hygiene is maintained. I came across these super soft Pav buns yesterday and I had to buy it to make Pav bhaji.Some day,I would like to make home-made pav buns too..but thats for another post..hmm..later;). Steam/boil the vegetables till well cooked and keep aside. In a kadai,add oil and sauté onions along with the ginger garlic paste till the onions become translucent. Add the tomatoes and keep sautéing,till the tomatoes become soft. Add chilly powder,pav bhaji masala and salt and mix well. Now add the steamed/boiled vegetables. Mix well till everything comes together,add more water if required. Mash the vegetables well using a potato masher or with the back of a spoon. Add a dash of butter and a handful of freshly chopped coriander leaves. In a pan,add some butter and lightly warm/roast the pav on both sides. Serve hot with bhaji,chopped onions and a slice of lemon. It's one of my fav street foods. You can also pressure cook the veggies, it makes it easier and faster to cook...anyhow all of the veggies have to be mashed. BTW, the quality of the pav-bhaji masala makes a helluva difference to the bhaji. I'm a mumbaikar and I can tell. I recently had a serious craving for pav bhaji and my mom got lots of it for me, till I was happy. I love to eat pav-bhaji in place of meals. It serves as chaat and dinner. 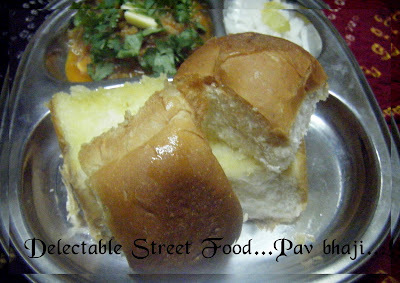 I just ate pav bhaji for dinner, and now you show me this delicious pav bhaaji!! I wish I had this one!! It looks mouth-watering!! Perfect street food!! I love pao bhaji, but always ate it at a chaat wala. Then I tried it at home a couple of months back and became an instant fan of the home cooked version. Yours looks lovely. I had wanted to make it for so long... and I finally did! looks nice..but I generally eat just the pav because of cauliflower in bhaji..for making pav, you can check arundati's or veggiefoodist's french roll. i have made them thrice and it comes out very well..
photos look mouthwatering!!! awesome treat!! Hey, recently I made it in microwave. Will be posting sometime.One friend made bhaaji without potatoes because I was off potatoes at some point. 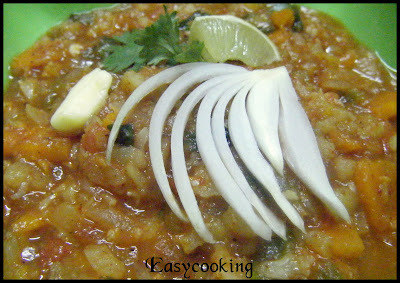 She used ground urad dhal base-equally delectable. 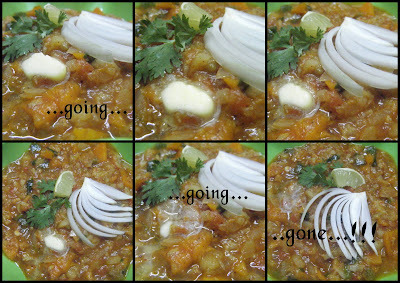 I am craving for pav bhaji now! looks really delicious divya! lovely pictures yaar..so tempting...my sis has promised to make this for me , but somehow getting postponed..
Oh wow thats everyones fav.. can have many and any time of the day..looks so yumm and me too make the same way. Pav bhaji at its best!Looks yummy Divya.